When a school bus has finished its life ferrying children around, it often ends up as someone’s pet project. Most buses in the US, however, have annoying back doors that lock only from the inside, which isn’t very convenient if you’re loading/unloading gear. Drawing inspiration from another project that fit a simple deadbolt upgrade, [Leonard] took the build one step further and hacked together his own keyless entry deadbolt system. He started by removing the white safety bar that normally covers the long red handle and attached a slide bolt to the door. 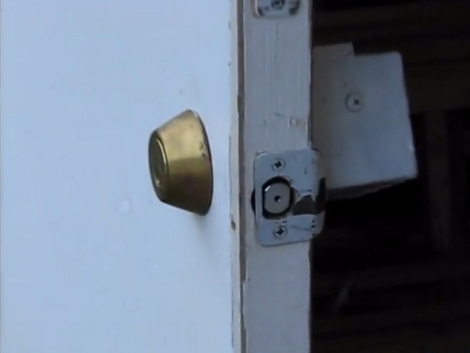 The slide bolt serves only as an extension for the deadbolt, which would otherwise get whacked by the red handle. [Leonard] made a few modifications to the slide bolt so it can sit flush against the bus’s lock bar, then went to work attaching the keyless deadbolt. At 2.5″, the bus’s door is actually thicker than standard doors, not to mention this build needs the deadbolt to move along the door’s surface to push the slide bolt fitted to the door. [Leonard] decided to throw in a chunk of wood as a kind of “simulated door,” which mounts next to the slide bolt and houses the deadbolt’s guts. Check out the video after the break to make sense of the door’s operation and swing by [Leonard’s] blog to see what else he’s done to the bus. If you’re in the mood for more transportation hacks, make sure you see the Raspberry Pi CarPC. The key for [rybitski]’s apartment is a copy of a copy of a copy, and the landlord lost the original key years ago. The lock itself still works, but opening it with [rybiski]’s key is a chore. He wanted to make it easier to get into his apartment, and with Arduinos and such he figured he could make a keyless entry device for his front door. After figuring out how to open his deadbolt with an Arduino and a rather powerful servo, [rybiski] looked into wireless control options. He found a keyless entry remote, complete with receiver, that integrated perfectly to just about any microcontroller project. After mounting the Arduino, receiver, and servo on a piece of plastic, he attached his contraption to the deadbolt. In the video after the break, you can see his key fob remote locking and unlocking the deadbolt, all without jamming an ill-fitting key into the lock. College students have returned in droves to dorms and apartments at campuses everywhere. So this is the time of year we usually start seeing some coded entry hacks. [Charmonkey] recently took on the challenge at his new apartment. There were some caveats though. He needed to ensure the Landlord could still enter using a key, and he didn’t want to alter the door or the jamb in any way. What he came up with is a coded entry system that can turn the deadbolt. In order to mount some hardware on the door he removed the inner part of the dead bolt assembly and used the pair of threaded tubes on the adjoining lock section as anchor points. This holds the Pokemon tin he’s using as a project box securely in place. The rest of the components all mount to it. These include the stepper motor that actuates the deadbolt, a switch for manual operation, an Arduino, and a motor driver board. He got really creative with the keypad. The wires connecting it travel through the door’s peephole and into the smaller plastic project box that hosts the rest of the hardware. [Fileark] built an RFID entry system that uses a pretty ingenious alternative to an electronic strike plate. An electronic strike is a rather expensive hinged plate that mounts in the door frame and catches the door latch. But this system opens a set of double doors. The door without the handle is fixed in place and has a normal strike plate. But it also has a deadbolt mounted in line with that plate. When the deadbolt is extended it is flush with the strike plate, pushing the latch from the door knob back and freeing the door to swing open. This is a bit hard to put into words so watch the video after the break to clear things up. The system uses a cheap RFID package that provides a single signal line. This line connects to an old VCR motor which turns the deadbolt. Timing is provided by a 555 chip, and the deadbolt movement is limited by a couple of switches mounted along with the motor. Now that the unlocking mechanism has been built it would be simple to use other authentication methods for unlocking the door, like a wristwatch-based proximity system. The Makers local 256 sent us this USB authenticated deadbolt prject. For roughly $60 these guys built an authentication system that reads the serial number off of the chip in a USB storage device. The actual content on the memory in the USB device is not used at all. They are using a Freeduino board to control its behavior. It has a magnetic sensor that keeps it from initiating the lock when the door is open. They mention that they are using Transparent Aluminum as an enclosure, we assume they mean the Star Trek variety, not Aluminium oxynitride. Be sure to check out the video after the break.